Cinematographer Gale Tattersall, DP of the TV show House mentioned the value of Marshall Monitor’s Peaking filter. Focusing with any present HDSLR is an issue. Canon DSLR lenses with their very short focus pulls are problematic which is exaggerated by the very shallow depth of field. Gale used a series of Canon lenses with the assistance of Marshall’s HDMI 7 inch monitor in Peaking Filter mode to keep critical focus. I might have suggested considering the use of either Zeiss’s HDSLR or Cine Lenses with long focus pulls and color matched glass. Either way, Marshall’s Peaking Filter would have come in handy. A peaking filter is used to help in getting a sharp focus which is especially hard with the tiny LCD on the back of HDSLRs that is normally used. How it works is the picture is turned into Black and White on the Marshall V-LCD70XP HDMI monitor with a red color appearing in the edges of areas where the picture is in focus. Peaking Filters work best after setting the picture to the best exposure and there is good contrast in the areas that need to be focused on. There is the added benefit of being able to place the camera in positions, such a high or low angles, where focusing with the camera’s LCD would be difficult, by using the appropriate length HDMI cable and being able to continue to pull focus. Is It Time to Throw Your Lightmeter Away? Cinematographer Gale Tattersall, DP of the TV show House, who was part of Canon’s Cine Expo EOS presentation on using the Canon 5D for the final episode, mentioned using Marshall Monitor for False Color. First, you should know what False Color is and how to use it. The False Color filter is used to aid in the setting of camera exposure. 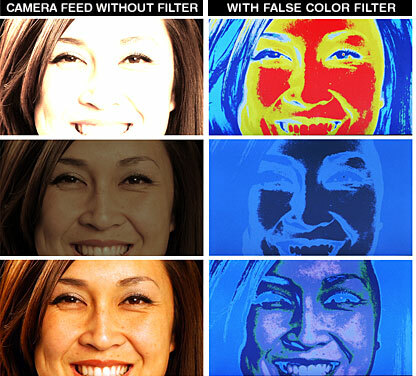 As the camera Iris is adjusted, elements of the image will change color based on the luminance or brightness values. This enables proper exposure to be achieved without the use of costly, complicated external test equipment. To best utilize this feature, you must understand the color chart and have a basic understanding of camera exposure. Normally, when shooting subjects like people, it is common practice to set exposure of faces to the equivalent of approximately 56 IRE. The False Color filter will show this area as the color PINK on the monitor. Therefore, as you increase exposure (open the IRIS), your subject will change color as indicated on the chart: PINK, then GREY, then a few shades of YELLOW. Overexposed subjects (above 101 IRE) on the monitor will be shown as RED. In addition, underexposed subjects will show as DEEP-BLUE to DARK-BLUE, with clipped-blacks indicated with a FUCHSIA-like color. Lastly, the color GREEN is used to indicate elements of the image that are approximately 45 IRE. This represents a “neutral” or “mid-level” exposure commonly used for objects (not people). If you have come to any of my workshops, you have seen a practical demonstration of Marshall’s HDMI monitor’s False Color Filter in setting exposure. The latest Marshall 7 inch HDMI Monitor is the V-LCD70XP HDMI. Surprisingly, Gale found Marshall’s False Color filter so useful that he seldom used his handheld meter while shooting with the 5D. Any photographer learning video production would have been very interested in the Cine Gear Expo 2010 at Paramount Studios in Hollywood. One of the highlights was cinematographer Gale Tattersall, DP of the TV show House, part of Canon’s EOS presentation on using the Canon 5D for the final episode. I had a chance to chat with Gale for awhile privately before and after the presentation as well, so I was able to get a bit more information on his digital workflow. Anyone who wants to see top work with a 5D Mark ll should watch the House finale episode. To keep everything I’m going to write about this in the right perspective, we must keep in mind that Gale is the DP for what I hear is the most watched TV show in the world. He has a team of experienced professionals working with him and the resources of a major network behind him. These are not unlimited resources, but they will do. Plus, he was concerned that he and his team only had three weeks of testing to refine the workflow before he started actually using the camera to shoot the episode. Right off there was some concern about projecting the clips on a full size movie screen at the Expo. Banding is a problem when you start off with a highly compressed format like the H264 coming out of the 5D Mark ll. Everyone in the theater was impressed including Gale and moderator Tim Smith of Canon with how well the picture held up. Remember, they made sure they started with the picture style set at neutral, the exposure was right on (I’ll write about this more later) and the color balance was right where they wanted it. Plus, (and here is a big tip) a little film grain was added to smooth everything out.